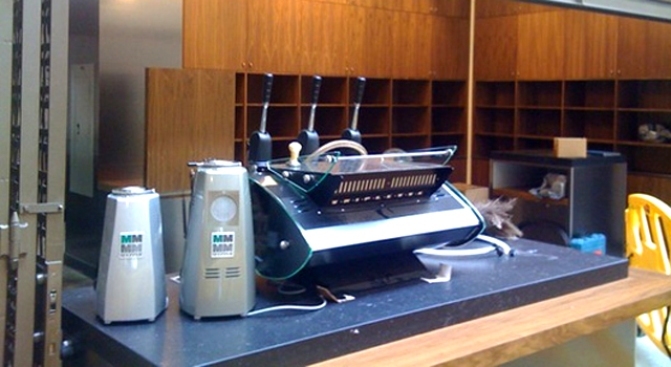 Blue Bottle Coffee is getting ready to open its new cafe in the Ferry Building. Ferry Building: The pretty little thing you see above is Blue Bottle's rapidly-approaching Ferry Building outpost, pictured here via the Eater Twitter feed. Seemingly overnight, the coffee joint is just about ready to roll out, with the doors open for public viewing, the shiny machines hooked up and the cabinets installed. According to sources, we could see a debut somewhere in the neighborhood of next week at the earliest. But as far as Blue Bottle news goes, that's not the half of it. UPDATE: Official word is that they’re building a roastery/cafe in the Jack London District at Webster and Third. Nothing doing in JLS proper (yet? ).